Since the first appearance in translation of By Night in Chile in 2003, English language readers have been treated to a near constant stream of short stories, novels, and even poetry from the late Chilean-born writer Roberto Bolano. He is that rarest of creatures: an author who has received widespread critical acclaim, as well as earning him a degree of popularity rarely granted to a foreign-language author in America — who never once appeared on Oprah. He is, in short, a cultural phenomenon. 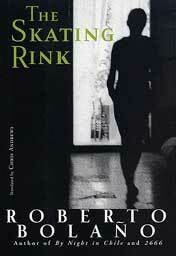 The Skating Rink is Bolano’s latest title to appear in an English translation, although his first novel to be published in Spanish. A haunting, mysterious work, yet another masterpiece from Bolano, it is perhaps an ideal entry way into his work, as it offers an introduction of many of Bolano’s favorite themes – violence, literature, and politics – all woven around the framework of a seemingly simple murder mystery. The book built out of short chapters, and utilizes three different narrators, two of whom, Remo Moran and Gaspar Heredia, are archetypal Bolano characters – young Mexican writers, living in exile in Spain, characters not unlike Bolano himself and of a type we will see again and again in his work, most notably, perhaps, in The Savage Detectives. The third narrator, Enric Rosquelles, an arrogant, overweight, Communist manager of the Social Services Department in the coastal Spanish city of Z, is the unlikely character who sets the book’s plot into in motion. Falling obsessively in love with the beautiful would-be Olympic ice skater Nuria Marti, Rosquelles embezzles city funds to build for her an ice skating rink, located in the otherwise abandoned, decaying Palacio Benvingut. At the same time, Moran has an affair with Marti, Heredia follows the knife-wielding drifter Caridad through Z, an elderly opera-singing vagrant makes her presence known, and soon enough, the skating rink itself becomes a scene of murder. This short dazzling novel, one that somehow manages to pose more questions then it answers, is yet another example of Bolano’s ability to create a fictional world that belongs to him and him alone. On first meeting Gaspar Heredia on a foggy evening in Mexico City, Remo Moran says that “his voice seemed to be conjuring lawless territories, where anything was possible.” The same thing could just as easily be said for Roberto Bolano himself. Robert Bolano’s The Skating Rink is published in the United States by New Directions. The original Spanish-language version, La pista de hielo, is available worldwide from Planeta’s Seix Barral imprint. MORE: Information and links to reviews is online at The Complete Review.